These earrings are just the thing you need to gain all of the spot light, and all of the complements you could ever want and imagine having. These earrings are the newest fashion statement, and you will be the one to own them! The lime green color that shines through the wonderful stone is sure to be a hit. 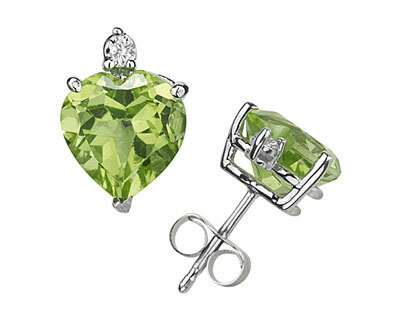 These stunning all natural heart-cut Peridot and Diamond studs are sure to be a winner amongst yourself, and anyone you may come across. There is sure to be a strong feeling of envy in the room! These earrings were made with 14K White Gold, which perfectly assets the colors to work together in union. The two colors together work in union and make a beautiful combination. The stone is a whopping 6mm, which is sure to catch everyone's eyes! The backs of the earrings are secured with a post-with-friction which is fantastic in ensuring that these wonderful studs will stay in place, and will prevent any pinching from a traditional earring piece. We guarantee our 6mm Heart-Cut Peridot and Diamond Studs in 14K White Gold to be high quality, authentic jewelry, as described above.